Jack Ferreira, Special Assistant to the General Manager. An All-American goalie for Jack Kelley’s BU teams in the mid-1960s and a member of the BU athletics Hall of Fame, Ferreira has had a long career in coaching, scouting and management, including Assistant GM for the New England Whalers, Director of Player Personnel for the Atlanta Thrashers, Director of Player Development for the New York Rangers and VP of Hockey Operations for the Anaheim Ducks. Bob Crocker, Amateur Scout, Northeastern U.S. 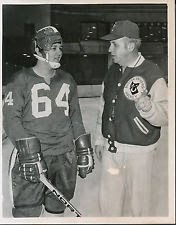 The “Dean of New England scouts,” Crocker played hockey and baseball as an undergrad at BU in the 1950s and later became the school’s head baseball coach and assistant hockey coach to Jack Kelley. Later, he was head coach of the University of Pennsylvania’s hockey team for three seasons and then spent 15 seasons as assistant general manager for the Hartford Whalers. Crocker later scouted for the New York Rangers, who won a Stanley Cup (1994) during that time, before joining the Kings' staff. He has now been a part of three Stanley Cup champions (Kings 2012, 2014), as well as two NCAA champions (BU 1971, 1972). 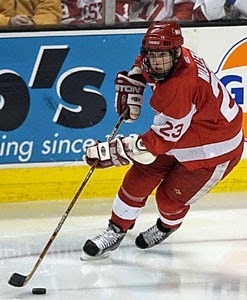 Mullen captained the 2003-04 Terrier squad. After playing minor league hockey, he later served as assistant coach for the USHL Cedar Rapids Roughriders before joining the Kings’ scouting staff in 2009. The HockeyWriters.com analyzed BU’s 2014 recruit class (prior to the recent verbal from goalie Connor Lacouvee) and how the incoming talent will help head coach David Quinn craft his type of team. With the NHL draft approaching, the Boston Herald checked in with MacLeod. The Dracut, Mass., native helped Team USA win the gold at the recent World U18 Championships with two power play goals and an assist in seven games. New England Hockey Journal talked with incoming freshman Jack Eichel on his priorities as he begins the next stage of his hockey career. Proceeds will benefit the Travis Roy Foundation, which is dedicated to enhancing the lives of individuals with spinal cord injuries and funding research, and the Franciscan, which each year provides care and treatment to more than 10,000 children with a wide range of physical, medical, and behavioral challenges.